And, when we cannot get together "live," we gather together in the virtual world of blogging. Thank you for joining us for our latest gathering, the FALL In Love With Texas Blog Tour. Come on in, as we throw open our doors. A schedule for the week is at the end. 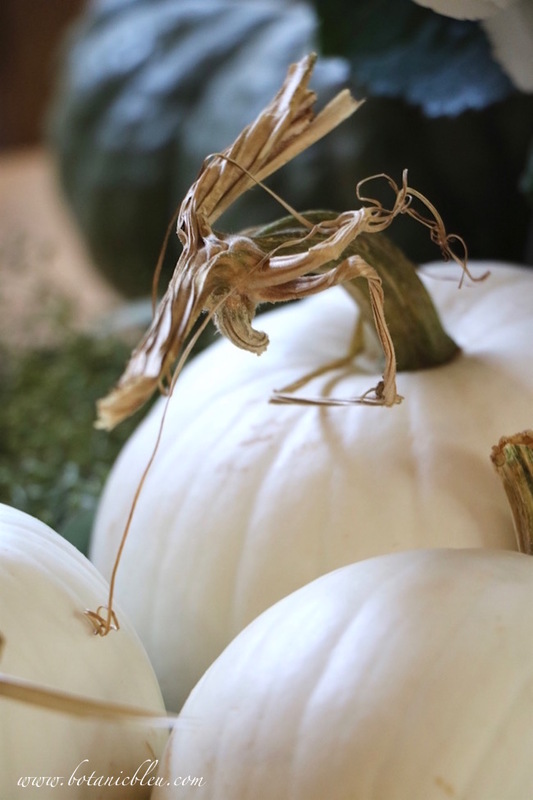 to see what Fall traditions, recipes, and decorations are going on in their homes. Stacey at Poofing the Pillows started off the tour with her new forever home which is gorgeous. Her limestone walls and fireplace spoke to me when I saw the first peeks during construction. 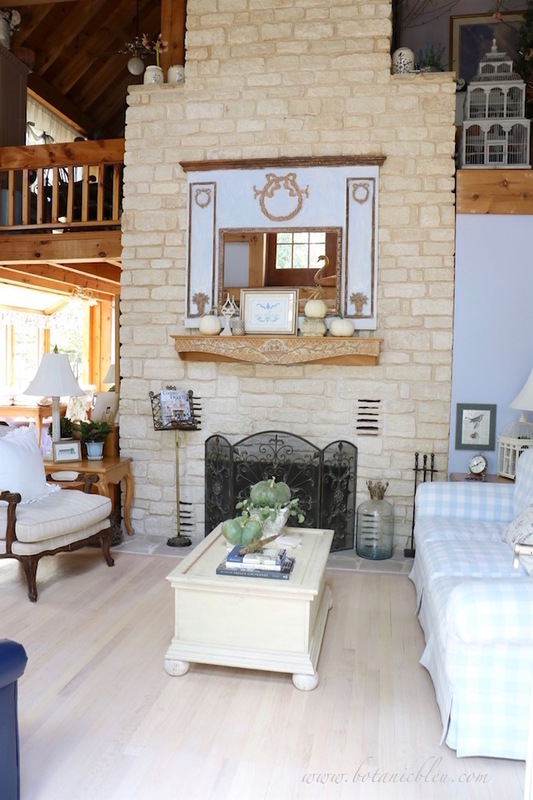 Then you will love seeing the limestone fireplace in my living room. 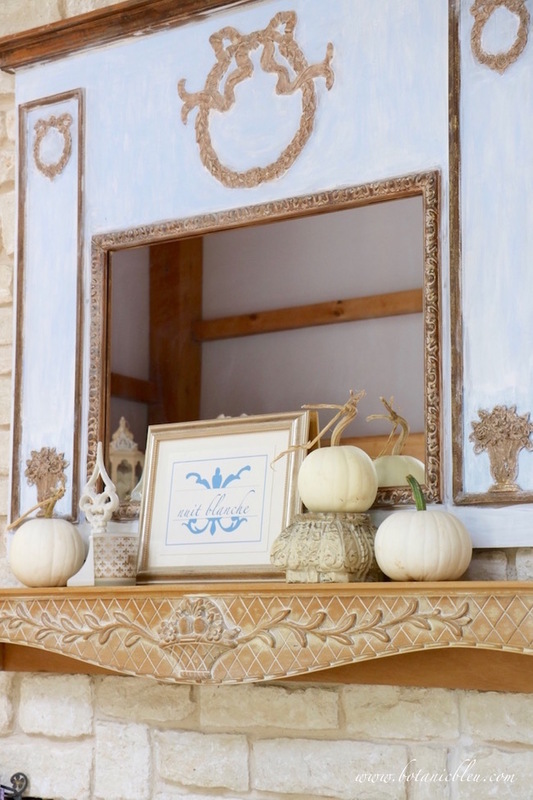 Decorating mantels for Fall is an old tradition. Using white pumpkins is somewhat a new tradition. The only color pumpkin used in Halloween decorations and Thanksgiving recipes by me until about five years ago was orange. Then along came Pinterest and blogs with white pumpkins, gray pumpkins, green pumpkins, blue pumpkins (not really blue, but blue-ish,) orange striped pumpkins, and the local pumpkin sources exploded with all the new colors, too. 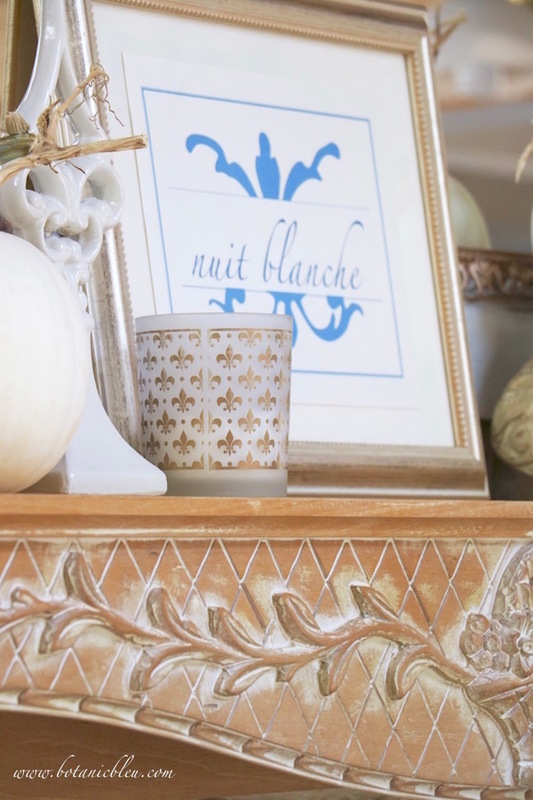 New Fall decorations were born and white pumpkins mixed well with French decor. Nuit blanche means white night in French. Nuit blanche is an idiom in French that translates to "pull an all nighter," as in a French student studying all night for a college exam. But, that is an old tradition, not a new one. The new Fall nuit blanche tradition, begun in Paris in 2002, is when all of Paris celebrates contemporary art in avant-garde artistic installations, concerts, exhibitions, staged scene sets... Public transportation and restaurants stay open all night as part of the festivities. Each Fall, nuit blanche offers a new view of Paris on the first Saturday of October. This year nuit blanche is October 7-8. The new Parisian Fall tradition has become popular in other French cities and has spread to other European cities, too. Is your passport up to date? You could be in Paris by Friday, rested and ready for this year's nuit blanche the next day. Green pumpkins are part of the new Fall traditions at my house. 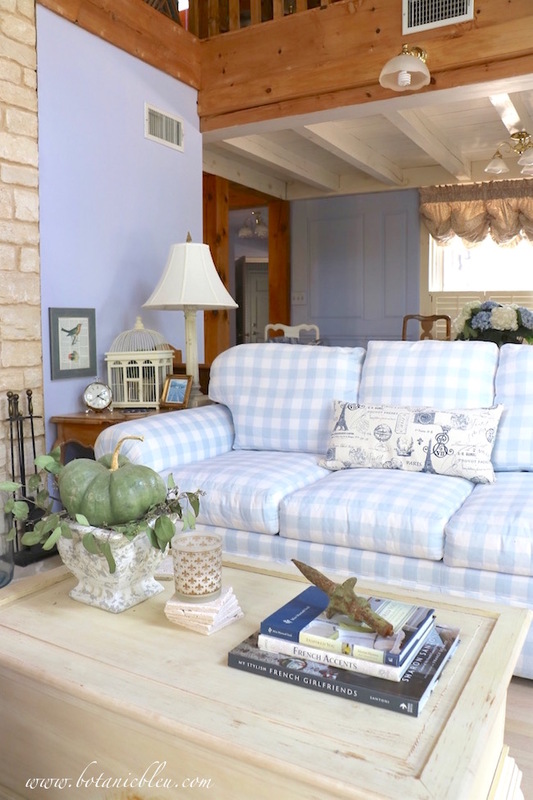 Miss Mustard Seed, Cedar Hill Farmhouse, and My French Country Home are three of the blogs that influence new decorating styles in my French-inspired garden and home in Texas. 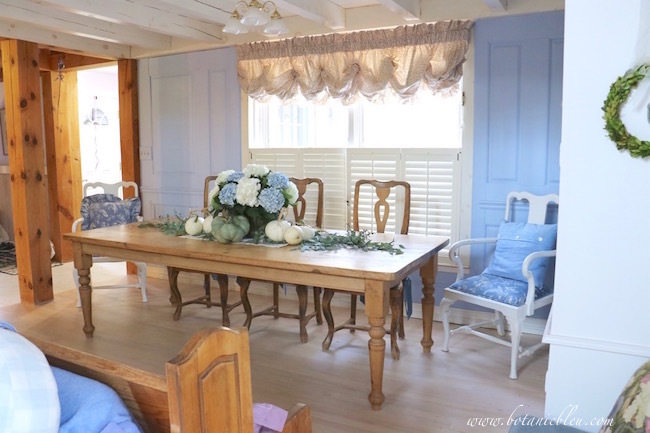 Soon I hope to add another autographed decorating book to my collection from a fourth source of French style inspiration, French Country Cottage. 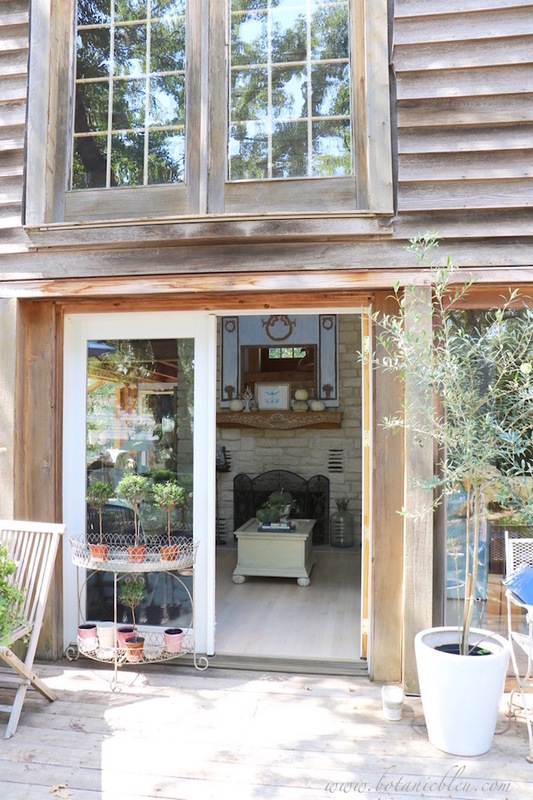 A large Palladian window and French doors bring the outside right into the living room. Little by little the furniture and accents are being replaced with pieces that reflect more French style. Small additions, like the white chippy urn, are easier to find than large furniture pieces. 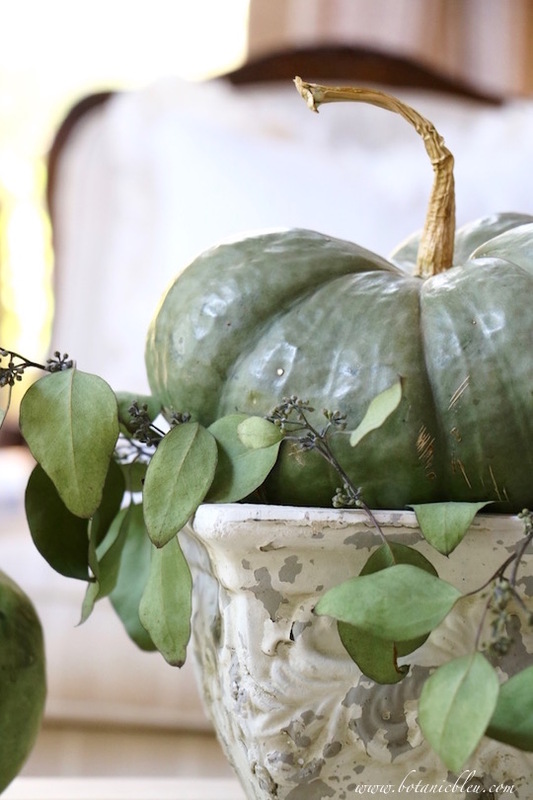 The color and style of the urn are perfect for new Fall decor with green pumpkins and seeded eucalyptus. 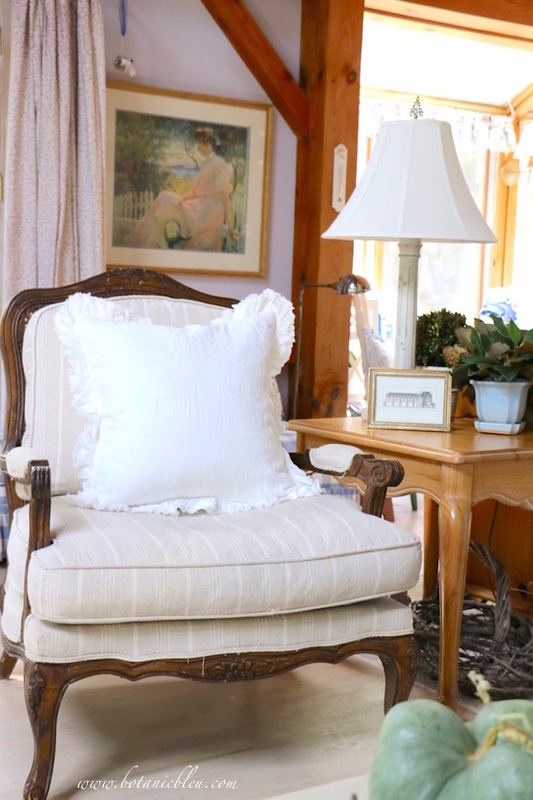 A new white ruffled linen pillow adds another layer of French style to the bergère. The living room and dining room are open to each other which allows a Fall centerpiece on the table to be enjoyed from the living room. 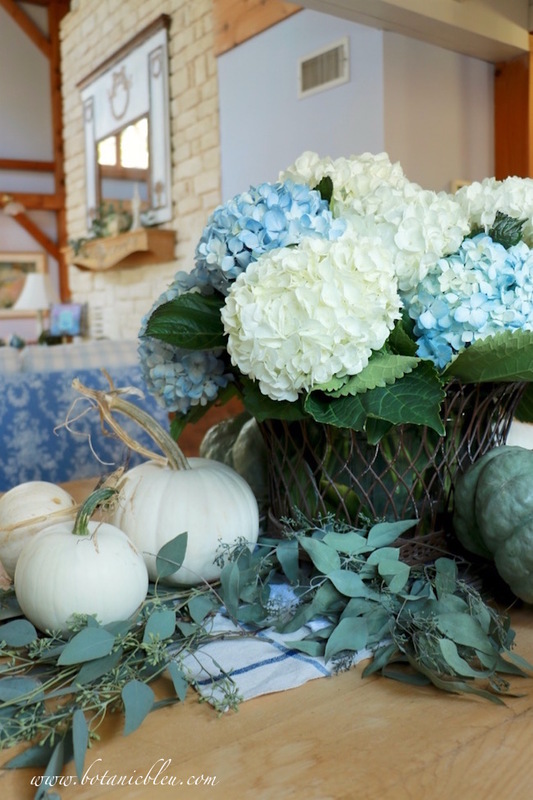 White and green pumpkins with white and blue hydrangeas are not the typical color palette for Fall, but work beautifully with the colors in the house. This is the view from the front entry hallway of the house. 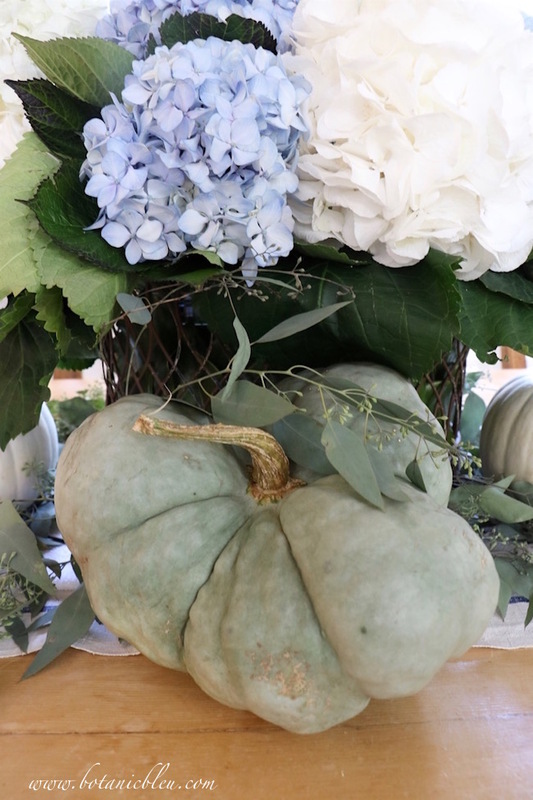 Whatever is on the dining table creates the first impression for visitors, and the pumpkins with hydrangeas display makes a beautiful first sight. A French wire basket is a new style for holding Fall arrangements. Twisted stems with character are another new Fall decorating tradition in the past five years at my house. Later this week I will share tips for how to create Fall decorations and will share a secret about these green pumpkins. When did you first discover seeded eucalyptus? Seeded eucalyptus is a new Fall decorating plant for me after seeing it used by others for 2-3 years. I have known and used preserved round leaf eucalyptus all my adult life, but it has never been one of my favorites due to its fragrance. 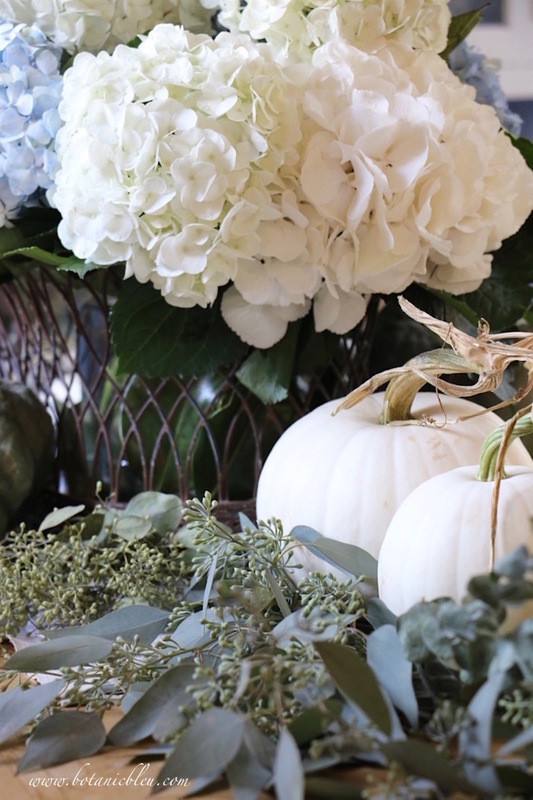 A Fall arrangement is easy to create with just one LARGE green pumpkin and a small cluster of seeded eucalyptus. Do you have any new Fall traditions? 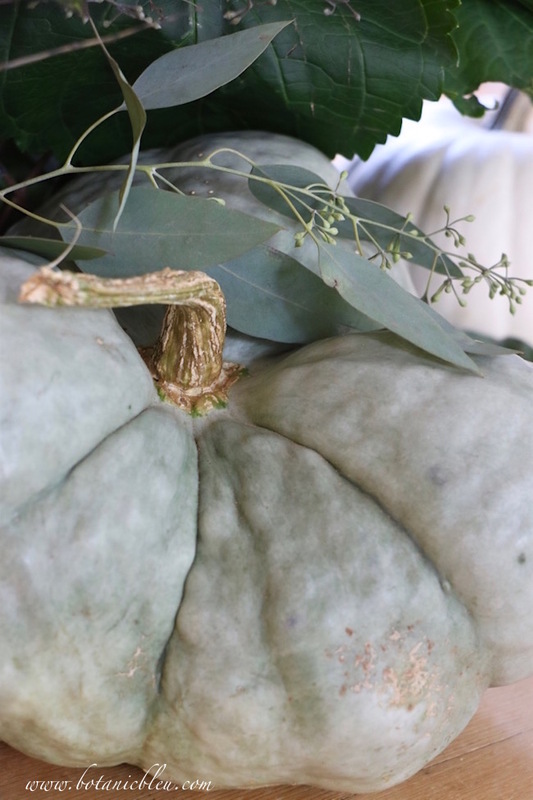 Are you a traditionalist when it comes to orange pumpkins? What a completely enchanting tour Judith! I adore your mantle and the gorgeous mirror above it. Sign me up for nuit blanche! Have a lovely day. Judith, your home is exceptionally beautiful. 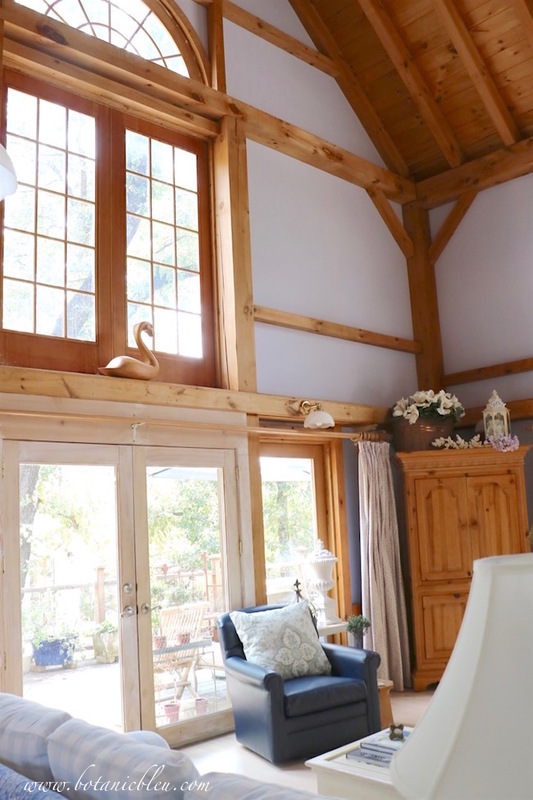 I am in love with the whitewashed floor, the painted rafters, the stonework, the windows.... I know you put your heart and soul into designing and maintaining that house and it shows! Your pumpkins are so pretty and I just might copy your dining table idea in my own house. 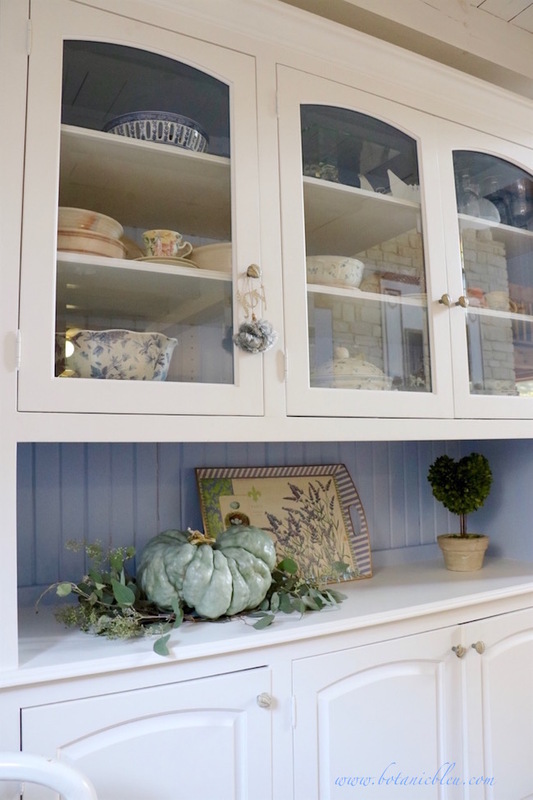 Judith, I love the combination of French and farmhouse and yes, all the gorgeous blue~green pumpkins. The hydrangeas are so beautiful. Make sme wnat to plant more bushes. I love your white painted rafters. Oh, and that chippy white urn. I scheduled it for Instagram. What a wonderful tour of your living room and dining room, Judith. 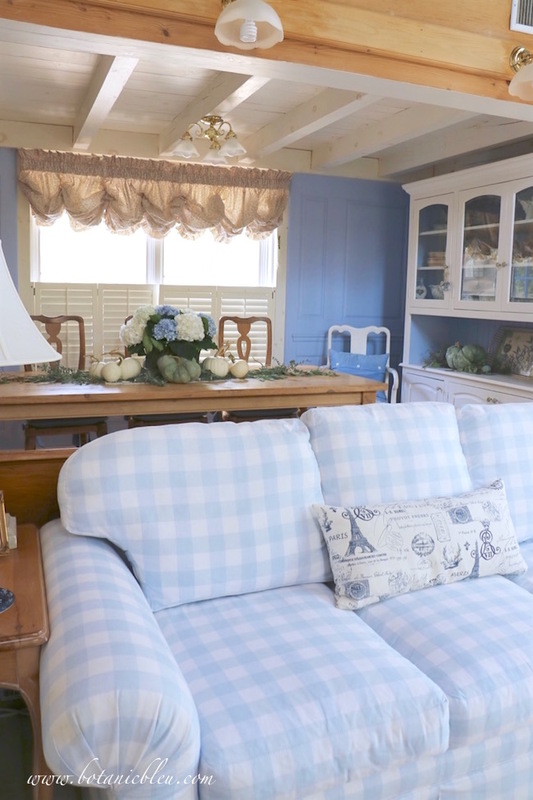 I love your soft colors and beautiful French touches, along with the green and white pumpkins. Your dining table centerpiece is stunning and a wonderful focal point. I haven't discovered seeded eucalyptus, but would love to find some. Like you, I have never liked to smell of eucalyptus, and avoid it. Thank you for sharing with us! I love the mix of new and old traditions and your home is just beautiful! The light is wonderful - what a happy home. I could wonder around in your home for an hour or so, I love the combination of the french farmhouse that you present. Your fireplace and mantle are beautiful. Thanks so much for sharing your beautiful home and your talent. I love your white and green pumpkins with the hydrangeas. Gorgeous. I love traditions both old and new. Thanks for sharing at our tour. Your home is bright and lovely, Judith. Great job! Your home is so cozy! Love that limestone wall and all your fall touches! Judith, your home is so refreshing! I love the green pumpkins. They are a new tradition in our home in recent years, those and the white ones. I like to mix in my Courtly Check, so the green works better than the orange for me. I also love to use seeded eucalyptus with my pumpkins, that and bittersweet. Both say fall to me. Thanks for the tour. It is lovely! Your French twist on fall is just beautiful. 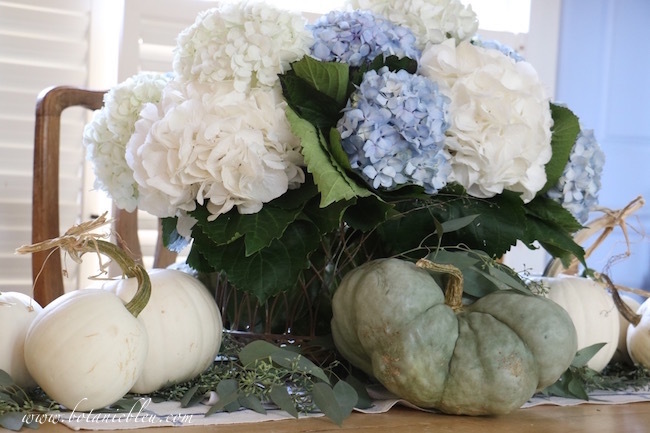 Love the combination of fresh flowers and pumpkins. Gorgeous home tour. 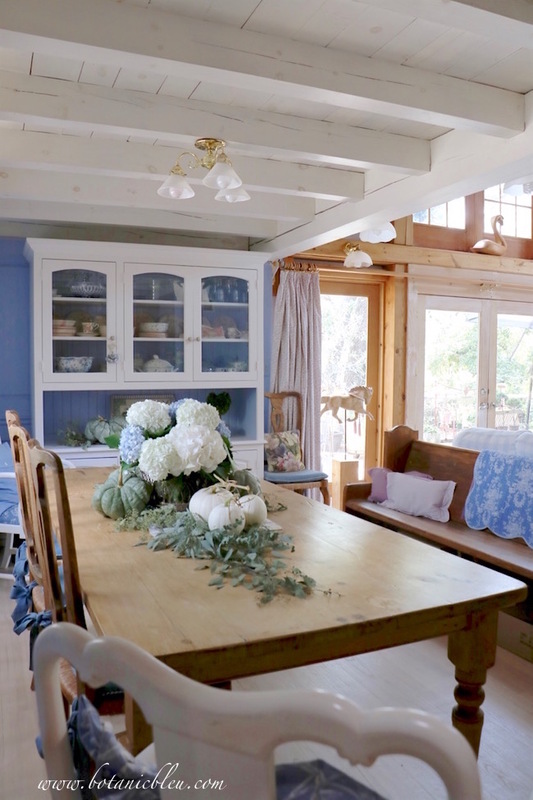 I so enjoyed looking at your French Country inspired home. The fall touches are beautiful! Love the colors you chose. I love how you have decorated and your living room and dining room is so pretty. 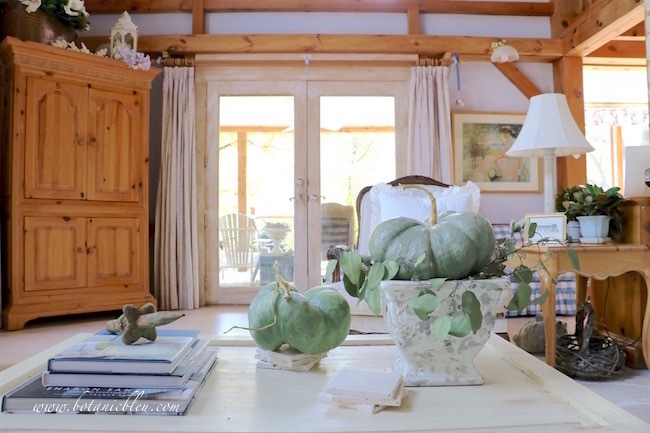 What a lovely home you have Judith...I also adore green pumpkins and gourds...it's all serene and soft....wishing you a beautiful fall season. You have a unique and beautiful home. I enjoyed the tour and all the details. I like the green pumpkins and the seeded eucalyptus. I guess my tradition for fall decorating is to use a lot of pumpkins. I use all colors and enjoy different shapes and textures. Judith, your home is beautiful and warm, and I love the autumn touches. Your dining room centerpiece is elegant and dreamy, and I have a crush on your sofa! Have a lovely week. 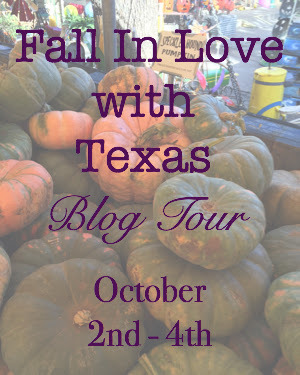 Love this fall tour with all the Texas girls! Your home looks lovely with all the fall and french touches. Blue is my favorite color so I am with you all the way. Also, love the seeded eucalyptus and bought some just recently. Yes, after seeing it for years I finally bought some. In my area it is hard to find. I also have to go a distance to find the heirloom pumpkins. It's all orange here! Hello, Judith! Wow, I love your home and your blog! It's so unique, and I love the blue in your kitchen. I also enjoyed seeing how you fluffed your house for autumn. No only is your house gorgeous, but your photography is incredible Judith!